Pumpkin pie is a holiday favorite for its use of the seasonal fruit, its warm flavor, and because it’s VERY easy–a big plus when you’re fussing over a big holiday meal. 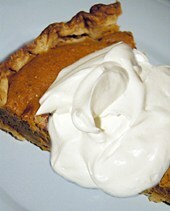 Pumpkin pie absolutely MUST be blanketed in an unholy amount of real whipped cream. Preheat oven to 425 degrees. Using electric mixer beat pumpkin, sweetened condensed milk, eggs, spices and salt. Pour into crust. Bake 15 minutes. Reduce heat to 350 degrees and bake 35 to 40 minutes longer. Cool. Just before serving, whip cream and vanilla together using an electric mixer. Serve over pie. This entry was posted on Thursday, September 13th, 2007 at 6:46 am	and is filed under Desserts, Holiday & Seasonal, Master Recipe Index, Vegetarian. You can follow any responses to this entry through the RSS 2.0 feed. You can leave a response, or trackback from your own site.